Monayi Angane Annayi, malayalam movie directed & produced by Santhosh Khan will have Aju Varghese, Bhagath Manuel, Hari Krishan in lead. Under produced under the banner of A to Z Creations, the screen play is handled by Ullas and Johnson. Vishnu Raveendran, Prem Kumar, Thampi, Antony, Anjali, Deepthi, Master Ajay, Assis will also be seen in prominent roles. For the lyrics of Beyar Prasad Santhosh Varma, the tunes are set by Vinu Udhay. Noushadhu Shareef stays behind the camera as the DOP. Malarvadi Arts Club directed by Vineeth Sreenivasan truly was a launch for many actors including Nivin Pauly, Aju Varghese and Bhagath Manuel. Nivin Pauly went ahead getting featured in a number of movies which include 'Thattathin Marayathu', 'Neram', 'Om Shanthi Osanna' and '1983'. 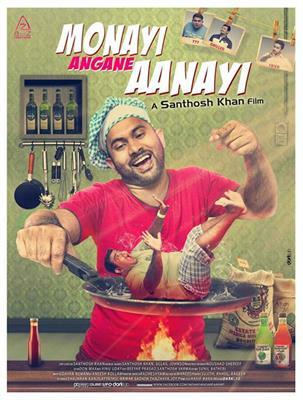 Now the team is back in action through Santhosh Khan's directorial debut 'Monayi Angane Annayi'. Apart from Aju Varghese, Bhagath Manuel, the movie features Hari Krishnan and new face Vishnu Raveendran in lead. The movie is themed around the life of 'Monayi' who don't know his real house or place. Not even well educated, Monayi is an innocent man with pure heart. Due to his naive character, he always jumps into trouble. As of some of his deeds, once he lands in a problem which challenged his existence. As he couldn't cop up with the situations, Monayi escaped from the village in a fortnight. Monai who is unfamiliar with the outer world reaches the city where his close friends Adithyan, Faizal and Mathan are studying. It took a little time for Monayi to adjust with the surrounding. Monayi's life in city truly changed his character a lot while he started enjoying it at its best. The transformation which happened in the life of Monayi was miraculous which even amazed his friends. The following incidents which happens in the life of Monayi, forms the crux of the story. Aju Varghese who has excelled in character roles would don the lead character 'Monayi'. Deepthi plays the role of Maya. Produced by Santhosh Khan under the banner of A to Z Creations, the movie is blessed with the presence of Vishnu Raveendran, Prem Kumar, Thampi, Antony, Anjali, Assis and Master Ajay. For the lyrics of Beyar Prasad Santhosh Varma, the tunes are set by Vinu Udhay. Noushadhu Shareef stays behind the camera as the DOP. The screen play is handled by Ullas and Johnson.